CD review: "Highways & Honky Tonks"
This review first appeared in the November 21, 1998 edition of the American Reporter. 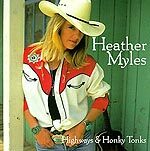 Heather Myles is a nice reminder of what country music used to be like before Nashville was taken over by yuppies with MBAs and marketing portfolios, when songs got on the radio because a d.j. liked them and not because they scored well in focus groups. Rose Maddox  that's about as good a comparison as there is. Bit of a tough gal, but sentimental and vulnerable, too, if you get close. Even if you don't remember the great Miss Maddox (one of the true giants of country music who ruled the airwaves in the '50s), you remember the type  Angie Dickinson in "Rio Bravo." Miss Kitty on "Gunsmoke." Calloused hands from doing real work and covered with dust and sweat, yet a darn sight prettier than any East Coast debutante ever could be. Which probably explains why Heather Myles gets about as much airplay as Rose Maddox these days  Nashville's too busy pitching us bows-and-lace types like Shania Twain who'll appeal to fresh-scrubbed suburbanites in their SUVs. Myles' music is too honest, too real for the suit-and-tie set that runs country music in the '90s. Her songs cut to the heart of life, her voice carries real pain. The arrangements aren't watered down, but have honest-to-God twang in them; the musicians in her band actually get to play. Her latest album is on CD, of course, but when that little silver disc stops spinning you almost wait for the "tick ... swish ... tick ... swish" of a needle at the end of a 45. Of course, this is only Myles' fourth album, so it's not like she was even recording when jukeboxes still played 45s instead of digital media. What she was doing, though, was listening and absorbing. Songs like "You've Taken Me Places I Wish I've Never Been" and "True Love" sound as if surely they are covers from old Tammy Wynnette or Willie Nelson albums from the early '70s  but they're new, written by Myles herself. As is "No One is Gonna Love You Better," which Merle Haggard sits in on. And then there's "You're Gonna Love Me One Day," which is quite simply one of the best country songs ever written. Like "Rum and Rodeo" off her first album, "You're Gonna Love Me One Day" is one of those priceless little gems that will still be sung a hundred years from now, whether Myles ever gets rich and famous or not. In every style of music, there is always a handful of artists who, for whatever reason, fall through the cracks, never quite break through to the bigtime despite having what everyone agrees is as much talent as any of the big-name stars. Don't let that happen to Heather Myles. Buy her CDs, go see her in concert. Make it worth her while to keep writing these beautiful songs, to keep serenading us with that wonderfully rough but rich voice.